Kušuḫ (Ugaritic: kḏġ or kzġ) is the Hurrian Moon god. In the Kaluti List [de] he is named after Ea and before the Sun god Šimige. Kušuḫ was syncretised with the Moon god of Harran (Hurrian: Kuzina). Kušuḫ, "Lord of the Oath" was invoked, along with his wife Nikkal, "Lady of the Oath" and Išḫara [de], as guarantor of oaths. 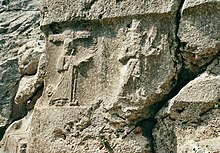 At the Hittite cliff sanctuary in Yazılıkaya, he is depicted as a winged god with a crescent moon on top of his pointy hat. He was identified with the Hittite god Kaskuh. Heinrich Otten: "Kušuḫ." In: Dietz Otto Edzard (Ed. ): Reallexikon der Assyriologie und Vorderasiatischen Archäologie. Volume 6, Walter de Gruyter, Berlin/New York 1980–1983, ISBN 3-11-010051-7, pp. 382–383.